Postage stamps are a natural place for art. Many postage stamps feature artwork or the image of a famous artist from their country of origin. However, there is a whole other category of stamps created by artists for their own use. For the most part, they are not intended to trick the postal authorities. So if they are sent thru the mail, a legal postage stamp is also applied to the envelope. Mail Art or Stamp Art are broad categories and there are many folks in the field who pursue this unique art form in different ways. 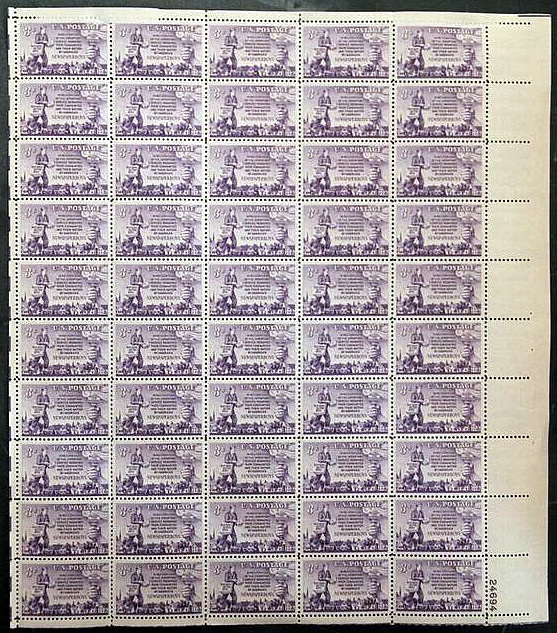 Some create a digital stamp that is then cloned using computer technology to make a whole sheet of the stamps like this USPS uncut sheet. 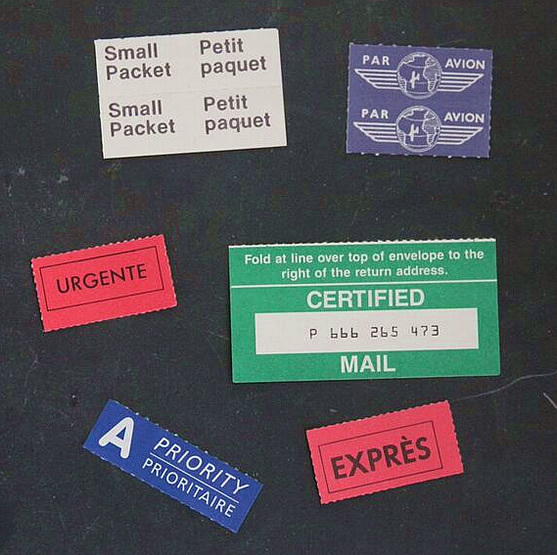 Many stamp artists extensively decorate the envelope, and many even have their own postmark. 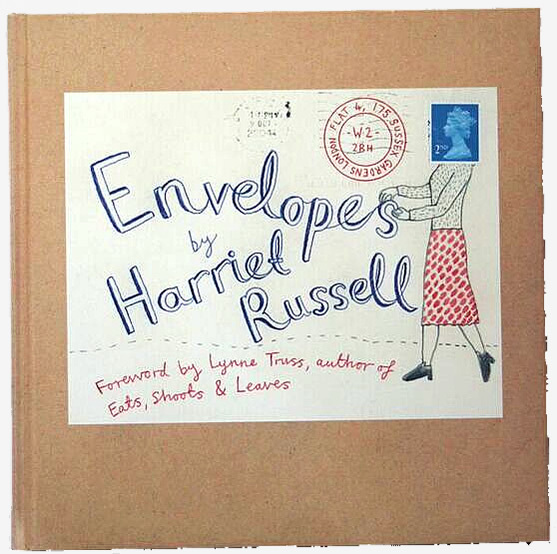 Harriet Russell is a British author who uses legal postage as part of a drawing on the envelope. Stickers are functional and also make nice additions to an envelope composition. 1-2018 : A superb artist that uses stamps as the centerpiece of her paintings I just discovered on Tumbler —Molly Rausch with a blog titled Postage Stamp Paintings. I hope to get her permission to use an image here soon. The internet has many websites devoted to these arts. A variety of names have been used to describe artwork on a stamp format, including one that I don’t care for — Artistamps. Artistamps was a term I think coined by Jas Felter who I once met in his Vancouver, BC studio, about 50 miles north of Bellingham, WA. He was an early champion of art and stamps, but as I said to him, “You don’t call them Artipaintings or Artiphotographs do you? Why use the term Artistamps?”. Nonetheless, the term has been commonly adopted and used. Donald Evans is my hero. He invented and perfected my particular form of this art. Neither his stamps nor mine were done on a computer, nor were they photo reduced, but rather painted one at a time on fine art papers at stamp size. Once you get a look at Donald’s work you will recognize how much it is plagiarized without credit. It saddens me that he doesn’t get the notice he should. Regrettably, Donald died in an Amsterdam fire when he was 31 in 1977. 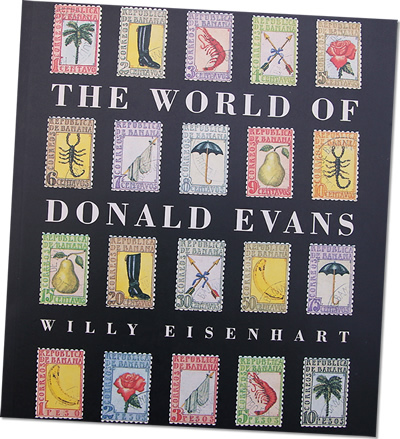 There is a book, now out of print, The World of Donald Evans which illustrates his wonderful efforts. I hope he will one day grace an official U.S. commemorative stamp. If you review his stamps you will see that he was more into philately than I. He would paint multiples of the same one, paint compositions with geometric borders of countries and values — the book’s cover gives you an idea of his style. Donald did not mail his work. I, however, have mailed mine because I feel by trusting them to the mail they have “flown” and traveled as they were meant to do—– taken far away, set loose, and worked their way home. It gives them a life, a history, and an adventure of their own. They are birthed. Please see the quote from Hundertwasser at the top of the page. Life can be disheartening, difficult, chaotic and busy……….but always it seems…..one can notice a pretty girls smile, or pink in the sky or taste some chocolate or meet a friend or hear a familiar song. Donald invented an art form, a difficult variation of the larger Stamp Art, that fell into my lap after trying many different ones — it fits me just right and that is why I have stuck with it for 35 years. Over and over it gave me a way of celebrating the magic in life —trying to poke up thru the daily deluge of demands. He lives on in me and you and others though it has been 40 years since he died. The outlet his example provided has been essential to me, saved me at times, gave me an esthetic dimension that gave voice to my gratitude. More than most, I believe you would understand for me after 35 years — the deep pleasure of holding something he also held — sharing a small piece of common joy — both of us saying life is beautiful. In May 2017 I was able to get to Amsterdam and finally cross paths with Donald. Please see my Blog tab for some pictures and look for stamps from the Country of Evans under The Paintings Tab on the masthead. I typically create only 2-3 new stamps each year. 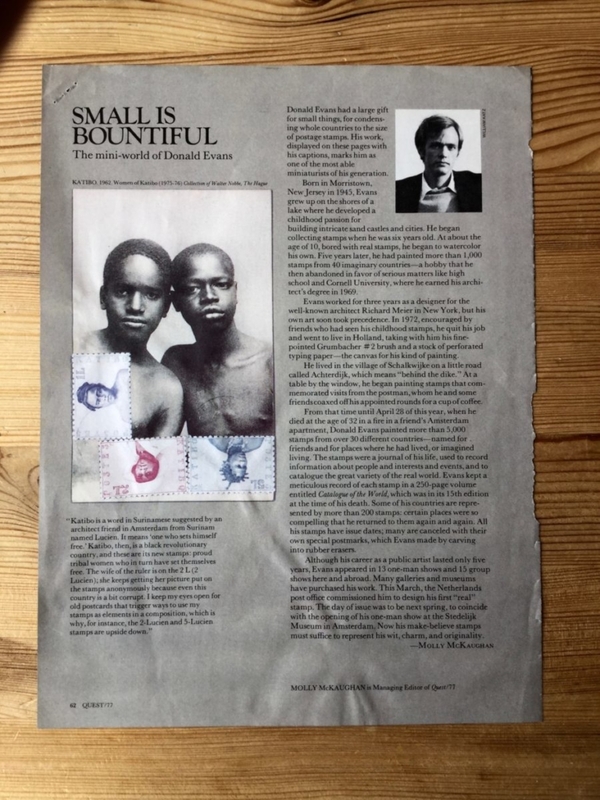 If you will be traveling someplace very unusual or very remote and can give me plenty of advance notice, perhaps you might take one of my stamps with you and mail it back to me. Please send me an email at brucebowden1@icloud.com if this interests you. I have always dreamed of designing a “legal” postage stamp for an existing country in the world. If you, by chance, are a government official in charge of postage for your country and would like to have me submit a design for consideration – send me an email at brucebowden1@icloud.com. Or, if you are the art director for Nike, Starbucks, or Patagonia, and would be interested in using one of my stamps or have a custom design created–please send me an email at brucebowden1@icloud.com. Thank you. © Paintings Disguised as Postage Stamps. All Rights Reserved.